Braniff International has always been associated with the most amazing liveries that have appeared on its aircraft thoughout its history. However, in this feature we'll be looking specifically at those liveries as they appeared on their BAC 1-11 fleet. Braniff International's association with the BAC 1-11 began when the airline's President Charles "Chuck" Beard placed an order for six Series 203AEs with an option on a further six aircraft on 20th October 1961. This was the first time that an American airline had bought a foreign airliner straight off the drawing board! The options were taken up on 5th March 1963 and a further two aircraft were ordered on 14th February 1964. The aircraft were delivered between March and December 1965 and were unusual in being the only airline delivered One-Elevens not to be fitted with ventral airstairs from new. Also, somewhat unusually, Braniff decided to refer to the aircraft as the "One-11" in all their marketing material! Services commenced on 25th April 1965. The first twelve aircraft (N1541 to N1552) were delivered from the Hurn factory in Braniff's early 1960s "El Dorado" livery, however the last two aircraft were painted in the company's new jellybean Beige (N1553) and Ochre (N1554) scheme introduced in 1965. Harding Lawrence replaced Chuck Beard as president in 1965 and he turned the conservative airline into a progressive and flamboyant carrier known for high fashion flight attendant uniforms, exemplary inflight service, and brightly painted planes. Lawrence' revolutionary approach was responsible for approving what became known as the "End of the Plain Plane" campaign in 1965, which called for imaginative aircraft paint schemes, interiors, and never before seen passenger service comforts. To overhaul the Braniff image, Lawrence hired advertising group Jack Tinker and Partners, who assigned advertising executive Mary Wells ("Lawrence" - she married Harding Lawrence in 1967) as account leader. In turn she hired renowned architect, interior designer, furniture designer, industrial designer and textile designer Alexander Girard who was tasked with the new braniff "makeover". This project gave Girard the opportunity to work with textiles, color, and graphics on a grand scale, redesigning everything from the sugar packets to the ticket counters to the color of the planes themselves. He used the colors to make the planes instantly recognizable from the ground. He favored a small "BI" logo and small titles however Braniff engineering and Braniff's advertising department modified Girard's colors, enlarged the "BI" logo, and added white wings, tails and engines. This, ironically, was based on the 1930s Braniff "Lockheed Vega" Schemes, which also carried colorful paint with white wings and tails. Girard also designed a line of furniture for Braniff's ticket offices and customer lounges. Between 1965 and 1968 seven different colours were introduced, powder blue, medium blue, orange, ochre, turquoise, lemon yellow and beige. In 1967 design company Harper & George modified Girard's original seven colors and as a result from 1968 to 1971 several colours were dropped, powder blue, medium blue, turquoise and beige and several added, dark blue, medium blue, lime green, panagra green, panagra yellow and red. A huge rebranding campaign took place and the new jellybean livery was introduced to the world with the very appropriate marketing slogan "End of the Plain Plane"! The management team gathered on the 3rd August 1965 to officially launch the new scheme and to thrash out the finer details. On Friday 1st October 1965 Braniff completed the repainting of a BAC One-11, N1544 with solid color orange. The following day Braniff closed the base for a photo shoot with N1544 with employees hired to act, and professional still and air to air photographers used to record the occasion. The first seven images show the aircraft as they appeared from late 1965 through to 1967. Notice that initially there were no marked exits in black around the main door or overwing exit and the 3-digit aircraft number wasn't shown below the cockpit window. It's very interesting to note that the colors are not based on photos but on the recollections of a gentlemen who was a teenager back then and not only lived near Kansas City - Charles B Wheeler Downtown Airport but flew weekly on Braniff due to a family matters taking weekend care of an aunt. He also made notes on each color and tried to replicate each on his ole Airfix One-Eleven model! N1544 is the most famous "Jellybean" One-11, as it was painted in a 'water-based' peel-off Orange paint in July 1965 for publicity photos, including an inflight photo session over Dallas. The Orange paint was removed, back to the delivery scheme until it was actually painted in it's Lacquer Orange for the 'Official' November 6th 1965 unveiling. There were two Original Orange One-11's N1544 & N1552. Next is the Sky Blue-Original 'Jellybean' color. There were two Sky Blue One-11's; N1541 & N1545. There were no Sky Blue repaints. The SB profile shows N1545 in 1966 after the mandated exit outlines and 3-digit aircraft numbers had been applied. Time to play "spot the difference!" One 'eyewitness' recalls Sky Blue....."One minute they were there, the next they were gone!" SB was "a very pale Light Blue, almost a white-ish Blue color". It didn't take long to look 'washed-out and 'faded' therefore, story has it that the FAA tower personnel began to complain that the Sky Blue aircraft tended to blend-in to the sky background and virtually disappeared! One of the Original 1965-66 colors, Lemon Yellow was perhaps the most striking! It was described as having a "bright iridescent glow" and that's definitely the case with this webpage image, so much so that you almost need to reach for the sunglasses! Sadly it suffered a quick demise as a "Jellybean" color solely due to the Pan American-Grace Airways (Panagra) 1966 merger. BI officials wanted the new '67 Harper & George colors to include Panagra's DC-8 Green & Yellow and that was the only reason Lemon Yellow was replaced by Panagra Yellow. There were no wear issues with LY and it was a beloved color. BI employees actually tried to save it but Braniff didn't want 2 Yellows! Only one One-11 was painted in Lemon Yellow. The profile shows N1548 as it appeared in late 1965-mid '66 before the Black exits and 3-digit aircraft numbers were applied. The fifth of the seven original colors is Turquoise. "Turquoise came and went fast......REAL FAST!" It was described as a 55% blue & 45% green, though sadly in photos the green comes out more than it actually was in real life. There were NO Greens until the new 1967 colors. The common Green film tint was no doubt the culprit on how the Turquoise "Jellybeans" looked in photos! TQ did become 'flat' rather quickly and may have disappeared for that reason. Also it may have fallen out of favour as it was a popular fashion color in the 1950's. Even freshly painted, the color just didn't have that 'pizzazz' that a "Jellybean" Lemon Yellow did for example! Just one One-11 was painted in Turquoise, N1549 and it was repainted to lime green during late 1967. The profile is of N1549 in 1967 with the now common Black exits and 3-digit aircraft number below the cockpit window. Last of the Original colors was Ochre. This particular airframe, N1554 was the last of the 14 One-11s built at Hurn and was delivered on the 22nd December 1965. "The 2nd ugliest color" is how our 'eyewitness' Chris recalls Ochre! "The single most difficult color to reproduce in photographs of the period". Photos of OC One-11's most often appear as a strange looking Brown. The film emulsions at the time used only 3-basic colors (Red-Green-Blue) and Ochre (a dark yellow-orange-ish) was impossible to create with those! Chris recalls; "the Ochre planes looked old and beat up.....grungy"! The color also had wear issues; "it tended to fade and blotch somewhat faster than any of the other colors with the exception of possibly SB (Sky Blue)". "Ochre was the only 'Jellybean' color to survive the entire "JB"-era (1965-71) unchanged. Orange did but with a slightly bolder appearance after 1967. Reportedly, Ochre was a personal favorite of Mary Lawrence, the BI President's wife and the color was a popular fashion color at the time but apparently not for the outer color of an airliner! N1554 remained Ochre for the entire jellybean period. The above profile shows it in late 1966 with the added 3-digit aircraft number and Black exits. There were a few minor differences with the two airframes painted by the manufacturer at Hurn.. The major difference is the entire front section to the wingbox was fully painted and the engine nacelles were 95% White with just a sliver of bare-metal showing underneath. The APU top and bottom panels were also unpainted. For the most part, there were three Ochre One-11's N1543, N1550 and N1554. N1543 was repainted to the popular Red in 1969. Dark Panagra Green was the first Harper & George Jellybean introduced in 1967 as shown above. There were two Panagra Greens and only later did "JB" enthusiasts distinguish them as (Dark) and (Light)! When the Harper & George Agency was hired to create new bold colors for 1967, they were advised by BI to include 3-Panagra colors to 'celebrate' the 1967 merger. Phillip George recalled in an interview, that the 'Panagra' colors were 'inspired' but not exact Panagra colors. The Dark PG was likely close to the Panagra DC-8 Green. The lighter Green was a planned color for the new DC-8-62 but were delivered to BI after the merger. Braniff was also opening new routes to the US Northwest (Seattle & Portland). W.R. Grace Shipping Lines also used this color for their ship's funnels. DKPG was only applied during 1967 (February-September) -Likely the shortest serving "Jellybean" color!!! Our 'eyewitness' Chris hated this color! It was so dark that the Braniff International titles were barely visible in daylight!! Not good for an image conscious airline! Chris noted that the color also faded to a 'flat' finish that ended up looking Army Command Transport Aircraft"!!! Only one One-11 was painted in DKPG and it was so short-lived that there are NO posted photos on N1545 in DKPG but Chris did see it and BI records also verify it though as 'PG'. N1545 was repainted in early 1968 in Lime Green.....99.9% of the 'Dark Green' "JB" photos are in fact bad Light Panaga Green photos! Panagra Yellow was the new '67 Harper & George replacement color for the beloved Bright Lemon Yellow. Braniff mandated that the Pan American-Grace Green and Yellow be included as 'celebration' colors for the then pending merger. Unfortunately, the Panagra Yellow (as seen on their DC-8's) was a bit of a dull Yellow and looked especially 'bland' when compared to Lemon Yellow! When our 'eyewitness' Chris saw his first PY, he thought; "it must be a batch a bad Yellow! ", in fact "it looked almost like a badly faded Ochre". It wasn't until he saw the LY side-by-side with a new PY, he recalls..."I was shocked how much brighter the LY was, compared to the less impressive PY". The new Panagra Yellow was a favourite 4-engine color but just one BAC One-11 (N1548) was ever to wear this "JB" color. The N1548 PY profile is based on a 1970 photo and shows the common late period features: Black & White exits, unpainted wingbox and a reduced 3-digit aircraft number now relocated to under the door. During 1968, Braniff relocated the VOR antenna from above the cockpit to the sides of the tail. Most airlines just put their normal logo on, then added the antenna but the problem for BI was the relocated antenna was now right in the middle of the U.S. Flag! So, a slightly smaller BI tail logo was now used and the Flag was placed above the antenna. N1548 was repainted to the very popular Jellybean Red at the end of 1970. 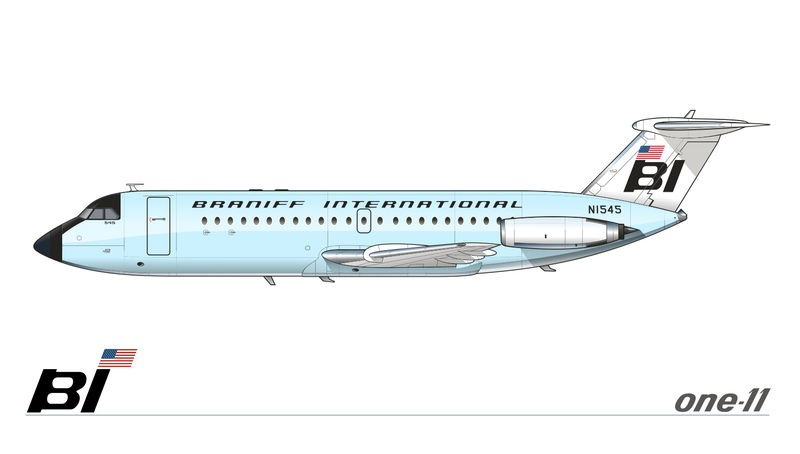 Braniff "Jellybean" fans can thank Qantas for this Harper & George color finally being applied to a single One-11! Our 'eyewitness' always said the bright colors were more popular, so it wasn't surprising when in 1967, a pair of new Blues were introduced. The Medium (really a bright Blue) Blue became one of the most popular 'JB' colors, while the Dark Blue was mostly just applied to one of each aircraft type but NOT initially to a One-11! Our 'eyewitness' recalls; "this color was a 'bland Blue', not really fitting in with the new bolder colors". Nearly three years into the H&G period, in June 1969, Braniff signed a lease deal for four Qantas 707-138B's, the unique 'short-body' 707 and one was delivered in HGDB. The 707 pilots loved the 'Hot-Rod' Qantas aircraft and goodwill seemed to rub-off onto the unpopular Dark Blue. In a surprise move, one of the three bright Medium Blues was repainted to HGDB! One-11 'JB' fans would finally get an HGDB during 1970- 'better late-than never'!! This color shows either Purple or Dark Royal Blue in photographs, so a sadly difficult color to get correct. The profile is based on a 1971 photo and has standard late 1969-71 period 'look'. Red would become the 'iconic' color most associated with the Braniff 'Jellybean' era, despite the fact that it wasn't one of the original seven colors! Chris recalls Red as; "more of a 'deep' tone not, as bright as a Fire Engine Red"! The color would become one of the two most popular late period colors, along with Light Panagra Green. By 1970, as the end of the 'Jellybean' was coming to a close, Braniff repainted some of the less popular 'JB' colors and there were no more Beige or Panagra Yellow One-11's.....The first Red One-11 was N1551, a former Beige aircraft in 1967. That would be joined in 1969 by our profile One-11 N1543, a former Ochre. In early 1970, the Panagra Yellow N1548 was repainted to Red but the Red trio didn't last long, as N1551 was leased to Mohawk Airlines in September 1970. Our Red N1543 One-11 profile is from a 1969 photo and shows the 1968-1969 period look with a smaller 3-digit A/C number and the more common unpainted wingbox......The 1st Red One-11 N1551 would remain in just Black exits until it's first Red repaint during 1969. 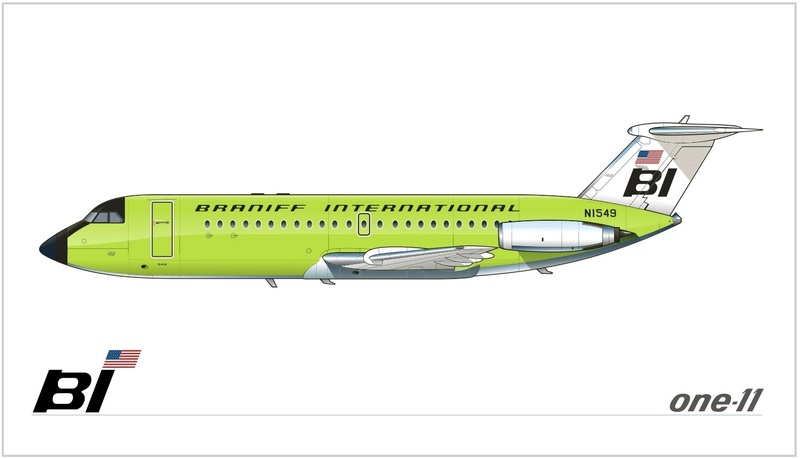 Braniff saved it's best (and worst) for last as Light Green (Lime Green) was introduced in the Fall of 1967. The bright color quickly became a favourite of BI employees and passengers but had a fatal flaw.........extreme oxidation! The color was continually being 'touched-up' by Braniff painters but the newly applied Lime Green never could be blended in. In LG photos, you inevitably see masked off areas or overspread portions of new Lime Green! No doubt the biggest 'headache' for Braniff maintenance employees of all the new '67 'Jellybeans'. Finally during 1970, BI began repainting Lime Greens to mostly Red or Light Panagra Green. N1549 was repainted from TQ to LG during 1968 and held on until Braniff's normal 18-24 month repaint schedule. Only two known photos exist of the LG which appeared on N1549. In those photos the Lime Green usually shows as a dull "Pea-Green" due to the film tints of the period. Our profile is taken from those and is shown in it's final 1969 Lime Green repaint. The Harper & George created Panagra Green (Light) would become one of the two most popular 2nd 'Jellybean' period colors (1967-71), along with Red. Chris recalls; "LPG was a nice Green that held up well. It was a bold Green but not a neon-like tone as Lime Green". 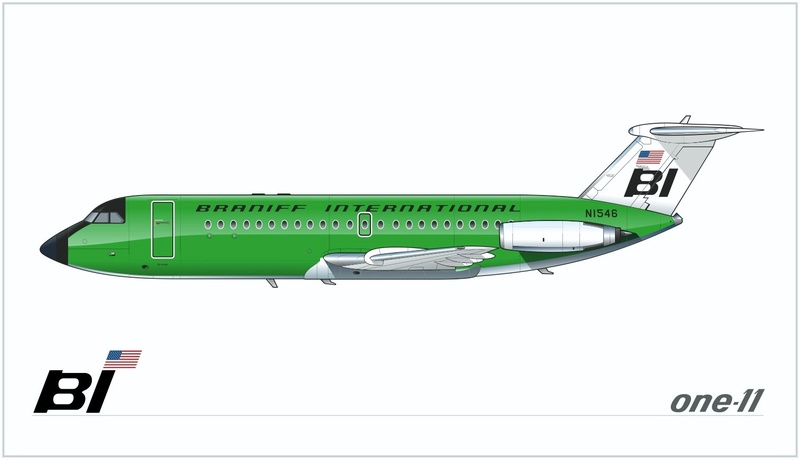 According to Phillip George of the Harper & George Agency, the lighter Panagra Green was 'inspired' by the Douglas DC-8-62 model which showed the newly planned Panagra color scheme. At the time of the new H&G 1967 colors introduction, Braniff adopted two shades of Panagra Green but it was only in later years that the 'Light' & 'Dark' prefixes were added. Since the 'Dark' Panagra Green was short-lived and rarely seen in photos, just about all the photos of Green 'Jellybeans' are this shade, though the film tint of the period shows this Light Panagra Green much darker than it actually was! There were a trio of late period LPG One-11's; N1545-N1546 & N1549. Our profile is the last One-11 to join the trio, as N1546 was repainted from Beige to LPG in 1971 and just recently the only known photo of it in LPG was posted. It was the only trio of One-11's in a single color to finish up the 'Jellybean' era, as both the three Red One-11's & three H&G Medium Blue One-11's, lost one each of their colors in during 1970. Our 'eyewitness' Chris recalled that when two or more colors of the same family were introduced, it was always the 'lighter' tones that did better and that was the case with the two H&G Blues. The Harper & George 1967 Medium Blue became an instant favourite of BI employees and passengers. According to Chris, it was really a Light Blue that "was a nice color, looked good on all the aircraft"! It's popularity continued to grow as it became one of the three most commonly seen 'Jellybean' colors during the final years. Chris recalled; "towards the end of the 'JB' era, there sure seemed to be a lot of them around, the MB's seemed to multiply like rabbits"!!! From 1967-70, there would be a trio of HGMB's; N1541, N1542 & N1547. Our profile One-11 is based on an October 1967 photo and has only Black exits applied. When the VOR antenna was relocated to the tail during 1968, N1541 would get the double-outlined exits and 'split' BI/US Flag tail logo. Unfortunately in photos, the brightness of this Blue was diffused by the common film tints and shows much darker than it really was. Thank you to John Evanich for his incredible research into this subject and also to the amazing talents of artist Eric LaBorde for all the time and effort he's put into producing the superb profiles shown in this very colourful article. Thanks also to "Eyewitness" Chris who clearly has a very good memory going back all the way to the 1960s when he was just a teenager! Either that or he made some excellent notes! It's much appreciated that somebody had the foresight to pay all that attention in days when cameras didn't exactly record the correct details in glorious color!